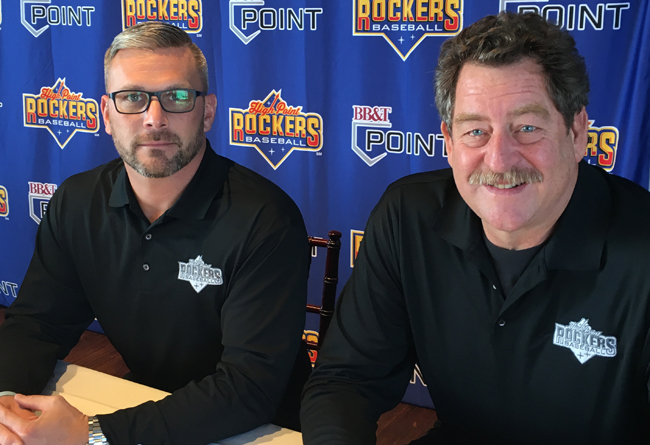 (High Point, N.C., Nov. 28, 2018) – The High Point Rockers announced the signing of their first ever Field Manager and Pitching Coach at a press conference in downtown High Point on Wednesday afternoon. Jamie Keefe, a sixteen-year veteran of Independent Professional Baseball, was named the team’s first manager, while Frank Viola, the 1987 World Series Most Valuable Player and 1988 Cy Young winner, was signed as the Rockers first pitching coach. Both Keefe and Frank were signed to two-year deals, ensuring a strong foundation for the team that will take the field at BB&T Point next spring. Each will help in the construction of a roster that will compete in the Atlantic League of Professional Baseball beginning on April 26, 2019 when they visit the Lancaster Barnstormers for the first game in franchise history. The High Point Rockers will play their first home game on Thursday, May 2, 2019 against the defending league champion, Sugar Land Skeeters. Fans can guarantee their seats for the historic Opening Night by placing a deposit on season tickets, which can be done by calling (336) 888-1000 visiting the team offices at 214 Lindsay Street in downtown High Point or by sliding to HighPointRockers.com. Additional information about player signings, the mascot, promotions, and single-game tickets will be made available in the coming weeks.